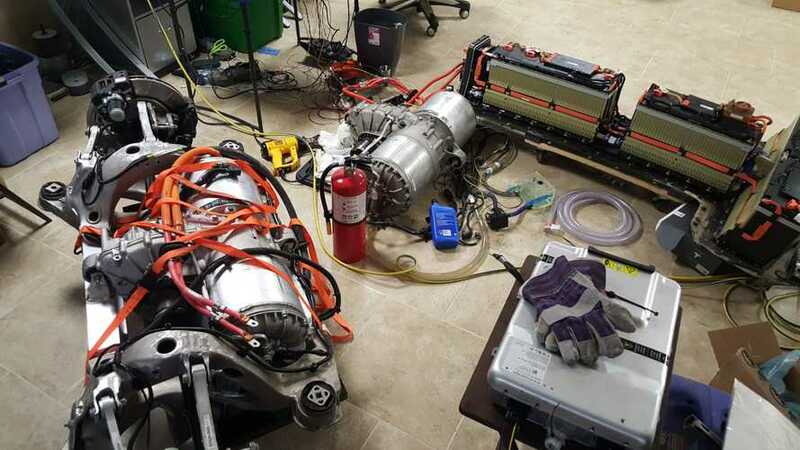 Jason Hughes' all-electric vehicles project moves forward with his two Tesla Model S drive units. The motors have now become operational and will combined with a couple first generation Chevrolet Volt battery packs. More about the project and upcoming 1,000 hp electric car to be presented at the 3000ev.com (and skie.net). Good thing I've got some safety coded into the controller so that it won't go from D to R at high speeds... that would have been bad... as in, the motor probably would have flipped. haha. Have to charge my Volt battery back up now, though... too much messing around."